This project is next generation business card for TechKeys. 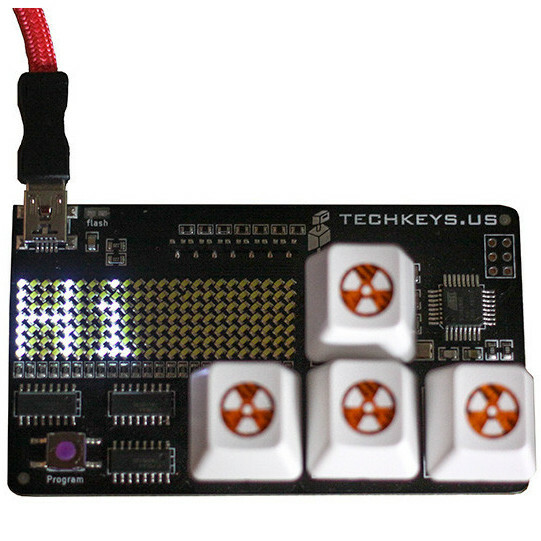 The card is user-programmable 4-key keyboard with a 24x7 intensity-graded LED display, where each of the keys can be assigned a single letter or a macro. The user can solder four Cherry MX switches, which will perform functions that can be programmed using a simple user interface. The card has a builtin macro editor and also features a hidden tetris game. Hey i just purchased this keyboard and am a noob at this stuff. Could you walk me through or tell me how to reprogram this card and if needed what programs i might need. Thank you for your time. found it and I'll be bookmarking it and checcking back often!